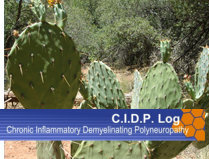 Definition: CIDP stands for Chronic Inflammatory Demyelinating Polyneuropathy (or Polyradiculoneuropathy) and is considered an autoimmune disorder destroying myelin, the protective covering of the nerves. Typical early symptoms are extremities "tingling" (sort of electrified vibration or paresthesia), numbness, frequent nighttime leg cramps, loss of reflex in legs/feet, muscle fasciculations (muscle bubbling), "vibration" feeling, loss of balance (ataxia), general muscle cramping and nerve pain. These CIDP symptoms may worsen over time, can effect the whole body, and also potentially lead to paralysis (mostly in the limbs). The cause of CIDP is unknown and is thought to be very uncommon but significantly underdiagnosed. In 2013 my CIDP neurologist asked me to keep notes on the effects of a six month immunoglobulin ("IgG" or "IVIG") therapy campaign and taking this seriously I decided that it would be useful to post these "notes" for others to see. Thus the launch of my CIDPlog. I continue to log my CIDP experience through early 2019. My "Mild" CIDP Diagnosis? : It took many visits to six neurologists over four years before, thankfully and almost by luck, I was tested by one who knew about CIDP and its symptoms. Up to that point I had been told for example “to take a holiday” or don't worry "some people are just like that”. : A significant contributor to slow diagnosis is the difficulty I had communicating the symptoms - doctors many times seemed overwhelmed by my descriptions and I feel focused on symptoms that were not relevant in my case (such as strength loss and disability scores*). But it is quite difficult for me to explain my symptoms as the sensations and physical effects are so mysterious. I began to think I was a hypochondriac and accepted this overwhelming view from my doctors but I suspect my athletics and healthy appearance didn't help when it came to diagnosis as doctors found it hard to believe I could be ill. Importantly, I now realize that I have a highly sensory (versus motor) version of CIDP (sensory-dominant) which tends to be invisible to an observer. Unfortunately I wrongfully stopped seeking medical advice for about a year. Since I was diagnosed with CIDP in 2011 through 2015 I am told that my test results indicate only "mild demyelinating sensorimotor polyneuropathy" - and certainly many others are far worse off than I. My atypical CIDP is apparently classified as multifocal acquired demyelinating sensory and motor neuropathy (MADSAM). Early on (pre-IVIG therapy) I experienced progressive very poor reflex in my knees/feet, very frequent muscle cramps, and continuous muscle fasciculations (muscle bubbling) especially in my legs.. In nerve conduction studies (NCS) and/or electro-diagnostic electromyography (EMG), I have slight prolonged F-waves and reduced amplitude latencies. I have slightly above normal protein in spinal fluid. By 2015 I have had progression overall and have more motor weakness including in my diaphragm. However, my sensory-dominant CIDP is VERY unpleasant, with the continuous pain alone unmanageable and if it is so mild I would say it would be unbearable to have a severe case of CIDP. I have had every conceivable investigation done over the years, even looking for an alternative diagnosis, but all in vain. Bottom line is that now in 2018 I know that all of the symptoms I describe in this log have their roots in my CIDP. My CIDP Development Overview: Started 2001 (aged 56) / Diagnosed 2011 (aged 65) / Progressed 2018 (age now 72 years). It was the strange bodily feelings that made me first think I had a developing health issue and ten years later medical assessments were indicating this too. Outward signs included loss of reflex in my knees & feet but my doctors remained perplexed. Soon the loss of reflex in my knees was total but I did not notice any weakness. About this time the previously invisible weird fasciculations began to show, intensify and spread. Then aged 65 years the 2011 diagnosis of mild sensory-dominant CIDP. See "sensory vs motor CIDP" under my cidp symptoms. Now in 2018 aged 72 years I have had significant muscle atrophy (my muscles sag and skin hangs) but I have maintained my leg-strength through commitment to running. My body responds slowly and requires a mental push: I can still do most physical activities but with less control. Now, it takes me about 100 steps to feel steady walking. Both my feet are "predisposed" to foot-drop. My leg muscles (and feet) have become like rocks and I have a constant day-and-night-time battle against numbness, cramping and pain! The cramps can be single muscle almost anywhere in my body or multiple places (like both leg/s and foot at the same time). I have a whole body invisible minute vibration, or buzz as well as 24-hr fasciculations (muscle bubbling) everywhere (especially legs). I feel weak (at rest) but in fact am not weak (in motion). I am unable to stay in one position for long particularly sitting at a desk. And in mid-2013 I had developed new unsettling breathing problems (at rest and in exercise) to add to earlier issues that crept up on me over about five years: So again, I find it somewhat troubling that my doctors refer to my "mild" CIPD (referring to NCS results) as clearly to me my symptoms are far from mild! My recent CIDP Timeline: March 11, 2015 I am told test results show no underlying improvement compared to two years ago and I have more motor involvement. By year 2016 I was having some of the worst days ever for torturous continual pain - in bold because my doctors do not recognize its significance or seemingly the nature of this pain - increasing upper-body involvement, sleep disruption and "sea-sickness" feeling. By early 2017 by breathing issue resolved: Nevertheless for the first time 2017 I feel my life is being threatened overall due to my CIDP, in particular by a feeling that my autonomic body control-system (for temperature, blood pressure and mood) is becoming increasingly unstable. By early 2019 I have experience continued symptom spread through my shoulders, neck and head. The eye-centered fasciculations that began wildly in March 2009 now effect my whole face & head and body! The condition is exhausting and I spend a lot of effort trying to reduce my twelve hours of sleep every day! I judge my overall health at 30% of the the pre-diagnosis level. My CIDP Management: Other than CIDP I have always had excellent health. As a 20 year veteran of 10k running I am very aware of changes happening to by body, and certainly did not expect to experience CIDP symptoms. But June 8, 2013 I tried and cannot run a 10k at my normal pace and indeed even a very slow 8.5k is problematic. My breathing prior to this issue was perfect - running a 10k with ease (NO elevated breathing necessary). This lasted about a year and by now in 2016 I am back to running 10km at a reasonable pace. Although movement is uncomfortable, exercise may be the best non-medical treatment for my CIDP. I also do daily stretching to alleviate cramping and I find frequent all muscle movement an essential treatment for my CIDP. Entering 2017 I find pain management a dominating need: movement, exercise, stretching as well as keeping "overheated" seem helpful in controlling my CIDP nerve & muscle pain. I have an excellent diet which is gluten free and this has reduced my CIDP-induced digestive discomfort. Previous to October 2017, I did not take drugs or vitamins (other than the IgG IVIG treatment, a blood product, commencing March 2011). However, this October 2017 I experimented with cannabidiol CBD oil extract from Cannabis Marijuana as a CIDP pain-killer but found it ineffective. In June 2018 I began I trial of very high "pulse-dose" dexamethasone corticosteroid aimed at better outcomes but this too was counterproductive. I avoid exposure to chemicals especially those at home including perfumes/lotion. More at "My CIDP Management of CIDP symptoms, CIDP pain, CIDP IVIG infusions ". Unfortunately my IVIG treatment was started too late due to the delay in diagnosis. I feel this was a result of the very low awareness of CIDP, patient-doctor symptom communications difficulties and the lack of expertise required to diagnose CIDP. I have personally witnessed that this CIDP expertise is limited to less than a handful in Canada and there is only one CIDP Clinic in Canada that I could identify. However, I do now have world class medical advice from the very best in Canada - indeed a fully internationally recognized Centre of Excellence CIDP Clinic (Toronto General Hospital)! Please write me with your CIDP experience: I would like to hear especially from CIDP patients who think I have missed something due to their own experience with CIDP. Exercise intolerance is a symptom of and is intrinsic to CIDP: Sometimes my legs feel they do not want to move and I have to "force" myself. But exercise is essential to alleviate CIDP induced loss of control, cramping, pain and muscle weakness. Interestingly some outstanding professional athletes (gold medalist no less) have written me about their experience with CIDP and impact of IVIG, for example. This is useful information as it appears confirmatory that exercise does not provide immunity against CIDP and also that exercise is a very useful treatment for CIDP (if you can manage it). GBS Guillain-Barré Syndrome relation to CIDP and the ZIKA virus: CIDP is the chronic version of GBS Guillain-Barre Syndrome meaning that it is more persistent with CIDP symptoms tending to develop over a much longer timeline - a diagnosis of Guillain-Barré Syndrome may be entirely reasonably later be revised to CIDP if the symptoms persists long term (over eight weeks). GBS Guillain-Barre Syndrome has in February 2016 been linked to the ZIKA virus (notably in Brazil & Columbia). If your symptoms are similar to mine, developed suddenly and you could have been exposed to ZIKA bearing mosquitoes you should seek medical advice as soon as possible! ** CIDP VARIATIONS: Chronic neuropathies are operationally classified as primarily demyelinating or axonal, on the basis of electrodiagnostic or pathological criteria. Demyelinating neuropathies are further classified as hereditary or acquired—this distinction is important, because the acquired neuropathies are immune-mediated and, thus, amenable to treatment. The acquired chronic demyelinating neuropathies include chronic inflammatory demyelinating polyneuropathy (CIDP), neuropathy associated with monoclonal IgM antibodies to myelin-associated glycoprotein (MAG; anti-MAG neuropathy), multifocal motor neuropathy (MMN), and POEMS syndrome. They have characteristic—though overlapping—clinical presentations, are mediated by distinct immune mechanisms, and respond to different therapies. CIDP is the default diagnosis if the neuropathy is demyelinating and no other cause is found. Anti-MAG neuropathy is diagnosed on the basis of the presence of anti-MAG antibodies, MMN is characterized by multifocal weakness and motor conduction blocks, and POEMS syndrome is associated with IgG or IgA λ-type monoclonal gammopathy and osteosclerotic myeloma. The correct diagnosis, however, can be difficult to make in patients with atypical or overlapping presentations, or nondefinitive laboratory studies. First-line treatments include intravenous immunoglobulin (IVIg), corticosteroids or plasmapheresis for CIDP; IVIg for MMN; rituximab for anti-MAG neuropathy; and irradiation or chemotherapy for POEMS syndrome. A correct diagnosis is required for choosing the appropriate treatment, with the aim of preventing progressive neuropathy.